Those who have taken my classes know how important the issue of food literacy for children is to me. I start every session talking about it before we get down to the nuts and bolts of making sushi itself. It all stems from my experience of growing up in the Jane-Finch housing projects, where welfare cheques were meager and nutritious food even more so. As a pimply kid helping to raise two younger siblings while our single mother worked three part-time jobs, learning about food literacy wasn’t exactly on my list of priorities; and even if it was, food literacy programs just weren’t readily available. The schools didn’t teach it (except for one year in junior high school, when we were taught to make classic WASP dishes like mac ‘n cheese and beef stroganoff by the eternally optimistic Miss Harriet — she never told us her last name– in her “Home Economics” class); libraries didn’t have books on it (at least what would have been intelligible to a pre-teen); and television was too busy turning our gaze to the kind of food that, even as children, we just knew was low on the nutrition scale because it was so high on the ‘craving’ one. Finally, local supermarkets, developed in board rooms far removed from the hub of immigrant life were not responsive to communities desperately needing to re-connect with their culinary roots (try buying napa cabbage to make kimchi, a Korean staple, at Price Choppers in the ’80s). Food illiteracy was the norm and everyone suffered for it. This is why food literacy for children became my singular focus outside of making a living. In my own small way, I wanted to get out there and let children discover what schools/libraries and television and the limited options in supermarkets did not let me discover during my own adolescence. But I felt limited in how I could achieve this. For years, I was “the guy who did sushi”, and for reasons that perplex me today, I didn’t give much thought to how my expertise in sushi could help my cause. In 2006, when I first launched my classes (it was called “Sushi 101” then), I lacked the imagination to find a link between sushi and food literacy. But within two years, with the help of some wonderful teachers and parents who shared my belief that the ABCs of literacy (reading, writing, math) must include food, I was in classrooms, teaching the basics of nutrition by rolling sushi. This was soon followed by overwhelming buy-in by decision-making adults who could help me make a difference. 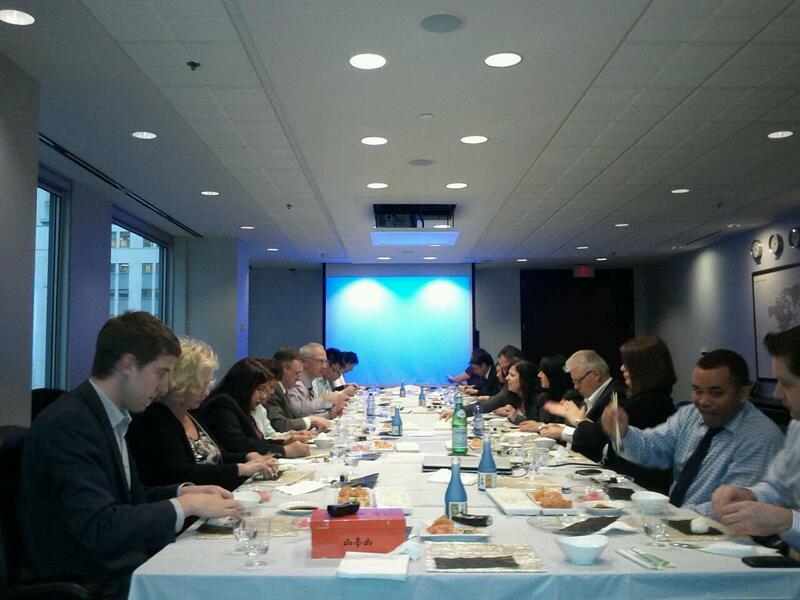 I was allowed into the boardrooms of multinational companies to teach their senior managers and executives how to roll a California Roll; but these people, many of whom had children of their own, seemed more interested in my food literacy quest than the difference between two grades of sushi rice or how nori is processed. They wanted to know the WHY of what I did and wondered how they could help me mobilize my ideas to far greater numbers of people. And, of course, that answer to the question “why” always comes easily off my tongue: it’s about the kids, about giving them free reign to deepen what they already know: that the preparation of nutritious food in a safe environment is a basic human right no matter your age and that a child should be taught how to engage his/her rights from the moment their parents register them in their very first institution. 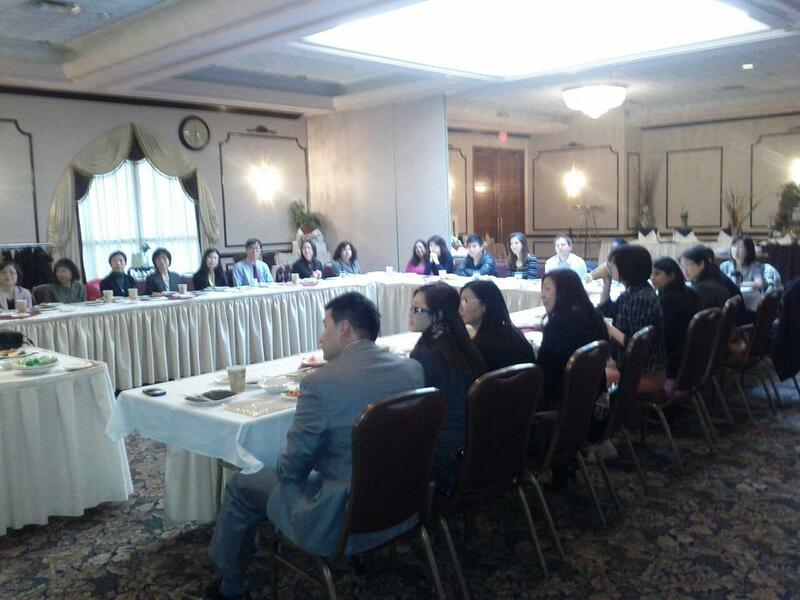 So in 2009, I set myself a goal: to conduct the world’s largest connected sushi-making class by 2015. The idea is a simple one: connect thousands of children from all seven continents, including Antarctica and the Arctic Circle, with hundreds of children here in downtown Toronto and teach them how to make sushi. This would be accomplished over a twelve-hour cycle via the internet. The ultimate objective is to get one clear message out to the grown-up world: that institutional food policies and food literacy programs should be adopted within our school systems with the goal of a healthy child at the center of it. The nourishment of the mind and body must have equal emphasis in the classroom. 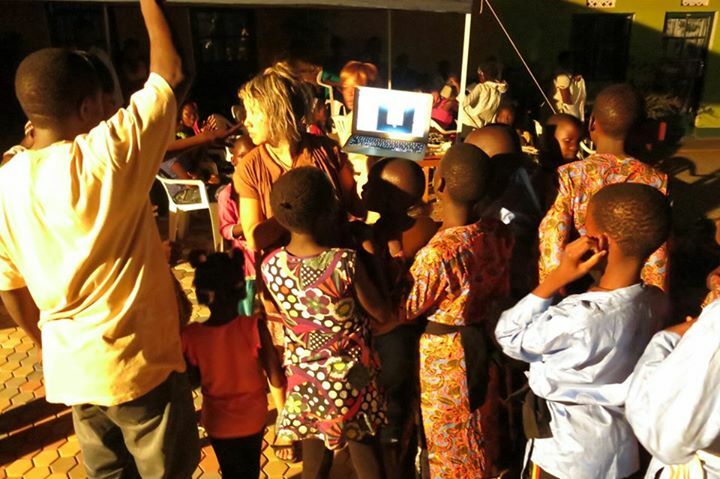 This spring, I did a pilot project with children in Kampala, Uganda. 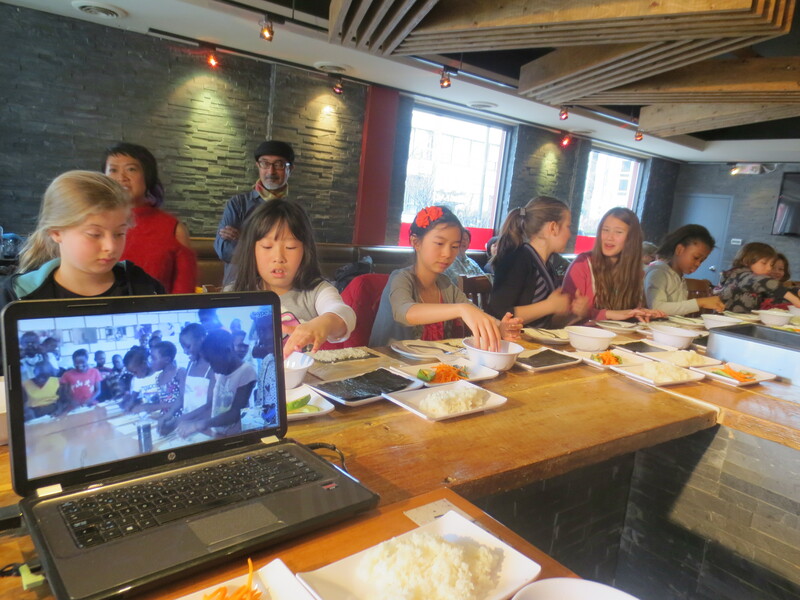 Through an organization, called Kids Canada, Ugandan children were connected with children in my Toronto restaurant via Skype. Other great organizations on the ground in Uganda also played a key role in ensuring the success of the project, including Kyoto Japanese Restaurant, whose owner, Ahmed Rende, and his chef procured all the ingredients; Insieme Si Puo, who was kind enough to offer the space for the class; Sosolya Undugu Dance Academy; and Pellitier Teenage Mothers’ Foundation, a powerful womens’ organization run by the indomitable spirit-warrior, Solome Nanvule. But, of course, none of this would have been possible without photographer and activist, Maylynn Quan, who does life-altering under-the-radar work in Uganda through her cultural exchanges, photography workshops, clean water projects, and micro businesses. Her astonishing generosity of spirit, as well as her experiences while she was in Uganda at the time of the pilot project, are documented in a blog called How To Change The World In 30 Days. It is moving stuff. 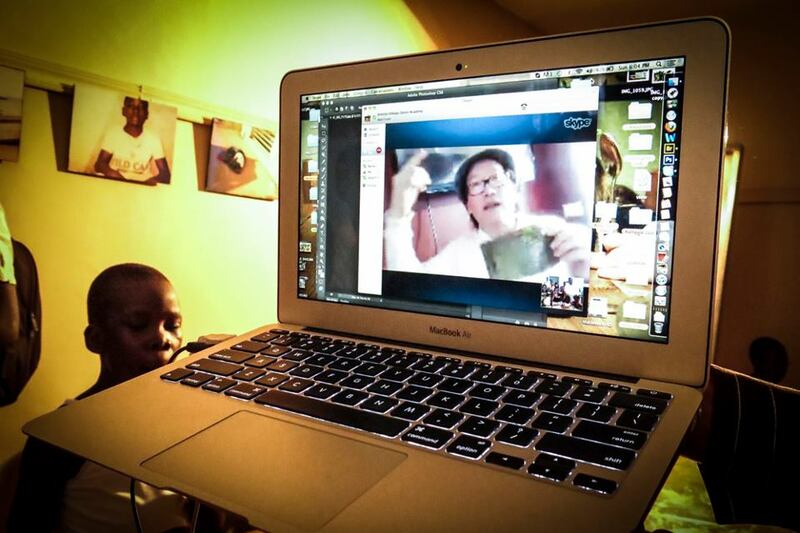 On Sunday April 14th, 11am local time and 5pm Kampala time, we linked up over a patchy internet connection. Children came to my restaurant, Yakitori Bar, and met with children over there gathered in the Insieme Si Puo office space. 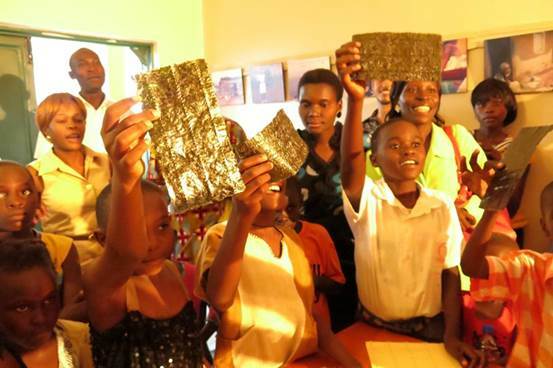 After a glorious showcase of traditional Ugandan music and dance by Sosolya to inaugurate the festivities, I taught the kids the basics of sushi-making through a webcam. They picked it up quickly and rolled with it. Children on a continent where sushi is an alien concept (read: exotic, oriental, Other) tried something new. They discovered, as children do (in spite of cultural, religious, racial, gender and continental differences), yet another way to explore the infinite possibilities of the world and their relationship to it. They went from ME to WE within a span of two hours, connecting with others in ways that was impossible for me at their age. Through a simple sushi-making exercise, they learned that food, like any of the other forms of love, unites. The experience transformed everyone involved. All of this was a prelude to a goal I set out for myself years ago: to conduct the Guinness Book Of World Records’ “Largest connected sushi-making class”. I want to do this by spring of 2014, but I cannot do it alone. I need help from people up and down the food chain and across all the partitions set up to divide people, especially children, in our society. Perhaps, dear reader, in a moment of revelry, as you look back at a time in your own life when you wondered why Reading, Writing and Math was so important to the adults around you but Food Literacy never got an honorable mention– perhaps you might find yourself afterwards considering ways to make this dream of mine (ours) happen? “Yes, the springtimes need you.